Jon Hamm has come face to face with his Don Draper persona. was on hand for the wax figure unveiling Friday at Madame Tussauds in New York, where he couldn't resist taking a selfie. "That's a no-brainer. I'm probably not done doing that either," he told The Associated Press. The wax figure is decked out in a debonair-looking grey suit. Ironically, Hamm arrived at the unveiling wearing a grey suit. "This is happenstance, but it is kind of crazy how kind of identical we decided to dress. I'm referring to him as a human being as if he dressed himself," he said. Hamm said he posed for the figure last year. It took months to craft the figure. 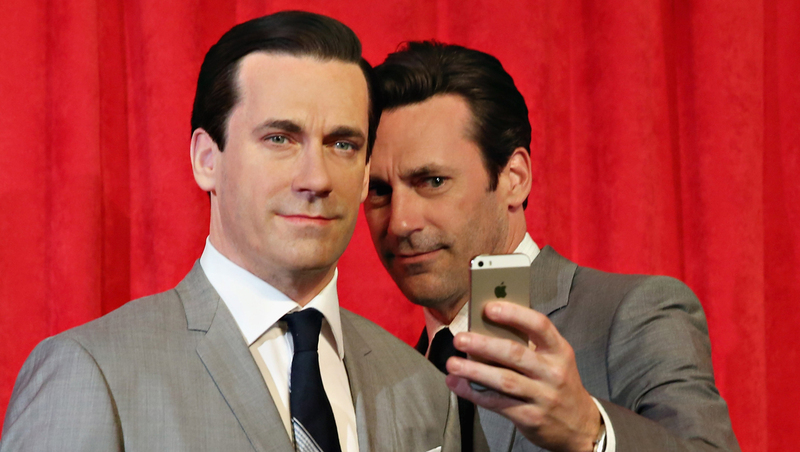 As Hamm posed for photos with his wax counterpart, he also joked about the stoic expression on the mannequin saying "a lot of people would say this kind of describes my acting [on "Mad Men"]. A lot of waxy stares, a lot of silent brooding." Hamm was joined by his longtime girlfriend, actress Jennifer Westfeldt, who kept marveling at how uncanny the figure looked like him. The 43-year-old actor is in the middle of a publicity blitz for his new movie, Disney's "Million Dollar Arm," in theaters May 16. "Mad Men" is now in the middle of the first part of its seventh and final season. The series airs Sundays at 9 p.m. ET on AMC.